GAMING NEWS: A Tale From The New World of Lustria!
. 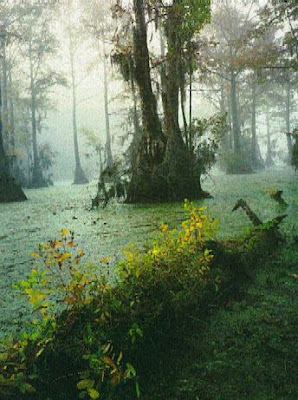 A view from the endless jungles and swamps of Lustria. 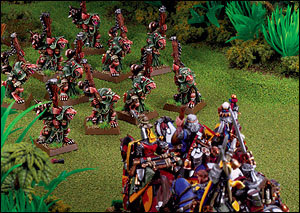 My latest gaming enjoyment has come from a Warhammer Fantasy Battles (WHFB) / Mordheim / Warhammer Fantasy Skirmish gaming campaign I’ve been playing with guys from the local DodT club… it’s been a blast. And, of course, we’re only about a year late and a few Dollars short since GW ran their Lustria campaign season AT LEAST a year ago, but what the heck! We’re having a good time! One of the little joys from the campaign has been to read some pretty fantastic short fiction written in the form of battle reports from our campaign. Defender of the Realm, Drinker of Fine Beer & Clown-o-phobe. It was hot - dreadfully hot. It reminded Captain Jan Carlos Flikker of standing next to the Heretic fires with his mother, back in his homeland of Castillia. Now he was wading through jungles and swamps halfway across the world, scouting for an elector count and trying to earn enough gold to get back his commission and form a new regiment of pistoliers. To do that, you curry favor of the Count - and that means gold and weird stone - and lots of it. And everyone knows that both are flowing out of the New World known as Lustria! “Captain - we have found some ruins!” called out one of his swordsmen. Flikker’s small but able scout party, like his own bloodline, was a mix of Castillian and Marienburger soldiers. Hire the best swordsmen and the best marksmen, and you get a war band that can deal with most anything. As the group of ten soldiers fanned out into the clearing, the scouting party could see two temples, one about the size of a house, the other the size of a small church. Between them in the center was a large rectangular stone pool. It actually looked clean enough to be inviting. One of his three marksmen pointed his musket towards the opposite edge of the jungle. Movement - lots of it. Like a lancer at full gallop, half dozen brightly colored lizards sprang from the jungle and dove into the pool with barely a splash. To both left and right larger lizard creatures, one with a brilliant red fan crest, bounded and skittered towards the warriors, using the jungle’s edge for cover. With professional ease, Flikker ordered his three gunners to shoot the creatures swimming towards them in the pool, the angle of fire was difficult, affecting no hits. The rest of the party fanned out to both sides, pistols, axes and swords ready. Franz, one of the champions, was hit by an arrow but it glanced off of his armor and only knocked him down. A hail of small arrows erupted from the pool raining down on a gunner that did not make it to cover in time; he fell with an arrow through his throat. Two large lizards broke out on the right flank and charged the Castillian swordsmen, who managed to hold them off and return blows. Firing his pistol into the pool at the swarm of small lizards who were the cause of the bow fire, Flikker and two of his heroes ran to the aid of the swordsmen, only to be knocked down and stunned by another hail of arrows. At the same time a swordsman ran his blade clean through a big lizard. Franz, halberd in hand got the attention of the lizards in the pool by standing alone at the edge and taunting them. The small lizards stopped their firing for a moment and looked up at him, giving the marksmen just enough time to draw bead and drop two of them. Blood started mixing with the water. On the Left flank, held only by an archer and the champion Carl, who was also knocked down by bow fire, came three man-sized lizards - one of them appearing to cast spells. Before they could get too close, Carl fired his pistol dropping one on the ground with a huge hole it it’s chest. A loud bellow rang from the Lizard with the red crest- his throat expanded into a large ball, reminding Flikker of a frog, or that Nurgling that exploded when he shot it, a few campaigns ago. All the lizards heard it too - and just as quickly as they closed in on the war band, they skittered away and into the jungle, leaving one of their own floating in the pool. It was going to be a long campaign, but after this skirmish the coffers were much fuller. Now to see about replacements - luckily the army has plenty of hand gunners. And the story itself was written by none other than the infamous Thomas Foss, one of the proprietors of Flagship Games, one of the most fun game companies around and the creators of Pirates!, Gunfight! and a number of other well-loved gaming rule sets. I’m going to Rivercats baseball game tonight so I’m excited – my first professional baseball game ever! Peanuts and Cracker Jacks and all that! 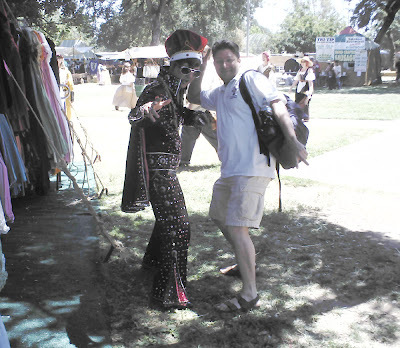 COOL NEWS: The King & I - Renn Faire 2007 Version!
. The King & I - Renn Faire 2007 Version! As previously mentioned I attended the local Renaissance Faire this past weekend (23 June 2007), which I found rather unexciting this year... maybe I'm getting old, jaded and cranky? Come on? Everyone loves a Henry the 8th impression! - Did I say lots of cleavage in tight bodices? - And you pretty much have the Faire summed up. I ran into all kinds of folks I know... from Kevin E., who can actually make English Country Dance NOT seem completely pansy ...to Doug the Cool Costume Vendor ...to great swathes of the ConQuest gaming conventions staff. There's a definite correlation between gaming RPG nerds and Renn Faire geeks. However, the highlight of the weekend for me (...besides all the cleavage) was seeing THE KING! This fellow had the great character and mighty stones to actually wear an Elvis sic Burger King outfit to the Faire. May he go down in the annals of infamy! I say Elvis sic Burger King because I wasn't quite sure which theme was dominant. Thanks Marcus for taking the GOOD photo! And a "double thanks" to my buddies, Vynnie, Mikos and Marcus for being such great company! A special shout out to my friend and fellow geek, Rivka! 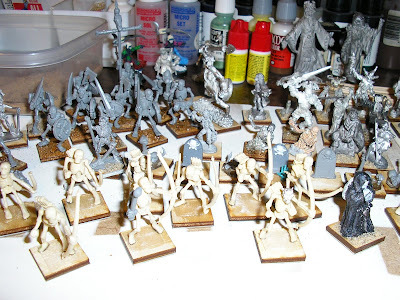 GAMING NEWS: 28mm Undead Invade My Work Bench!
. 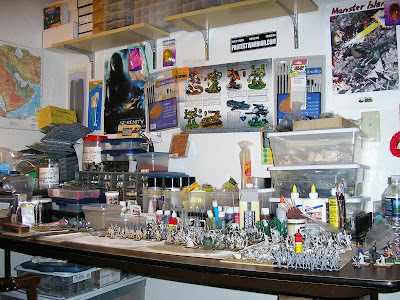 The 28mm Undead invade my work bench! Aaahhhh! 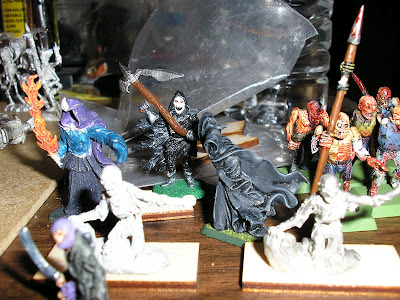 I worked on miniatures this past weekend as well some other activities such as visiting the local Rennaissance Faire, which wasn't all that exciting this year. 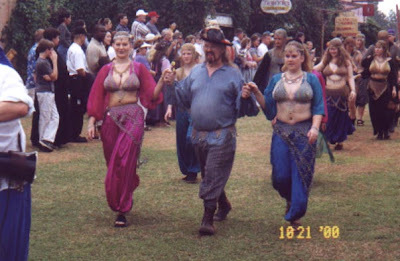 Lots of cleavage in tight bodices, overly fried foods guaranteed to give indigestion, lots of folks speaking with fake-o British accents and you pretty much have the Faire summed up. Gamers Union #1031 insists that the "cluttered look" is the ONLY way to go! I don't think I'll have any problems fielding 1,500 or even 2,000 WHFB points... and maybe more. 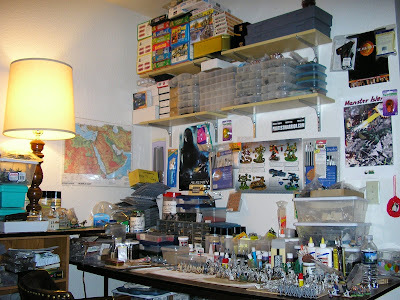 My flocking section along with files. And, yes, I love that huge rusty file! The collection is pretty gnarly... you could say I resurrected the remains of all sorts of undead toss-outs, bargain bin specials, and the accumulated left-overs of about half a year's worth of looking and E-bay scavenging. 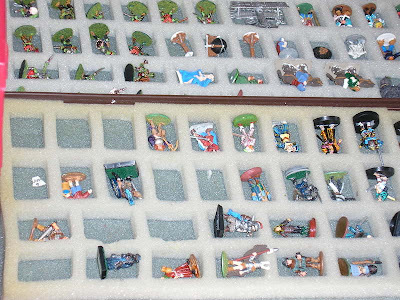 I have all sorts of GW, Grenadier, Ral Partha, Broadsword, Essex, Magnificent Egos, D&D Chainmail lead, D&D plastic collectible figs, Rackham Confrontation, Pewtercraft and only the good Lord has any idea who manufactured some of the rest of the figs. Posters are important. I have CAV, Serenity, Monster Island, and a map of the Middle East! Quite a few were conversion casualties I found in bitz bins and healed back up to fighting trim with the application of spare parts AKA bitz and generous amounts of vigor-restoring superglue. Oy! 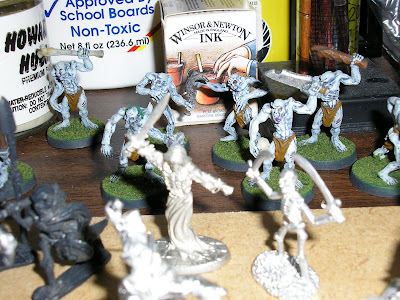 I have ghouls loose among my glue and ink... bloody blighters! I took these few snapshots to share with the gang and my blog visitors. I'm really looking forward to hauling the army out to play with Nils, the DotD gamers, Harry & Terry, and the rest of the Sacramento WHFB scene as time and the local DotD campaign allows. We're playing a Lustria campaign... a day late and a Dollar short. There are quite a few gnarly characters here... BOO! Litko rocks! I'm using Litko cut wooden bases with all of my figs. I have thin steel sheet under them so I can store my figs magnetically. GAMING NEWS: The Red Mikos Inn!
. The Red Mikos Inn. 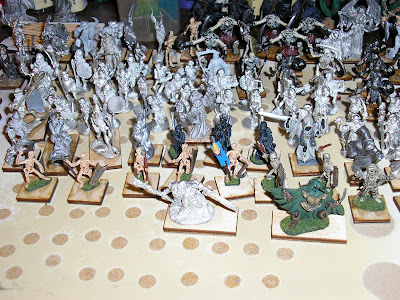 Some 28mm fantasy figures from the collection of Mikos... or George. 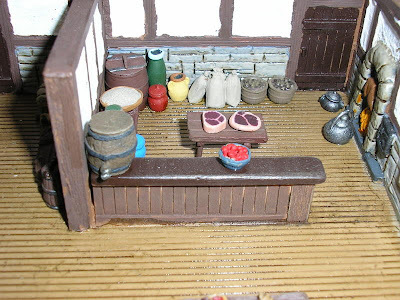 Perhaps we can offer you a fine meal from the Inn's kitchen? Or maybe you'd like to dine in a private cubicle? ...for a small fee... perhaps? A private dining cubicle within the Inn. 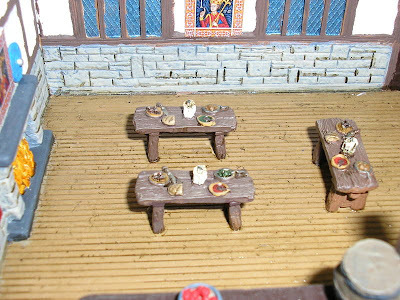 Or maybe you'd like to dine in the common hall? The common hall in front of a roaring fireplace. Or perhaps you need a room for the night? Private ones cost extra. Two private rooms within the inn. Most guests sleep on the floor of the common hall. The Apothecary of Mad Markus! 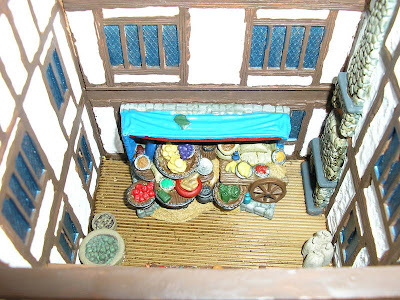 The first floor shop front of the Apothecary. So, pray tell, traveler, tell us what ye might need. 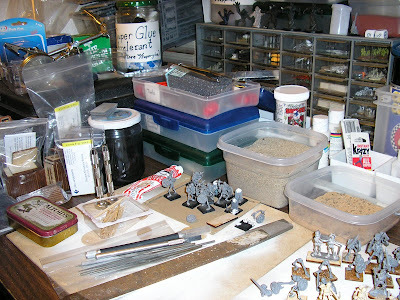 I get a great deal of enjoyment from miniatures gaming and although we all admire the eye candy, gaming's really about the friends you game with and I'm blessed to regularly game with such a nice crowd as Vynnie, Mikos, George, and quite a few others. 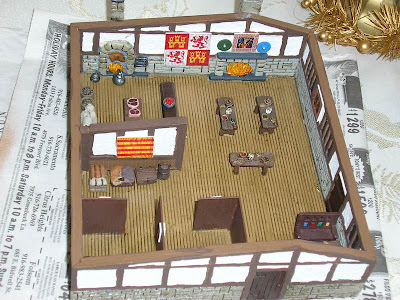 We played a 28mm fantasy game earlier this year in March and Mikos shared this terrain from his collection. George also provided much and Vynnie is always generous to host and make sure we're well stocked with trees, figures and whatever else we need. 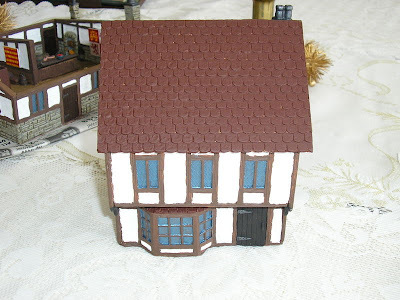 I'm in the process of scratch building some Medieval town buildings. 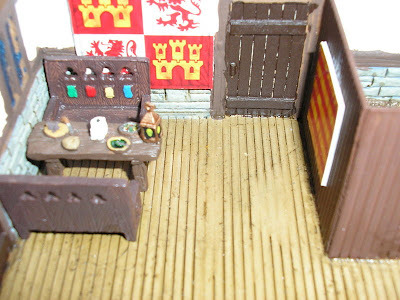 Does anyone have pictures of Medieval building interiors? 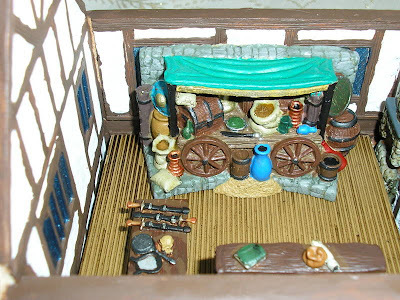 I'm looking of for taverns, inns, houses, shops, etc. It is for 25mm, but as long as it has enough detail, I'm for it. I've found lots of pictures of exteriors, but interiors are harder to come by. I'd appreciate any feedback. So, I hope this post helps you out, Ryan. 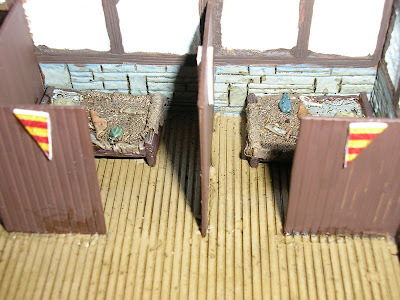 The base buildings are Armorcast although there are some Grendel terrain pieces and the details come from many different sources including doll house bits, miniatures bits, model kit bits, and the like. Mikos is a whiz with conversions and is always looking for something to add that extra touch to enhance our miniatures gaming experiences. I have 28mm Pig Wars Arabs up today from this past weekend's MWS gaming club meet. I still haven't quite figured out the DM framework, but it seems good so far and I'll figure it out with time. HUMOUR: Think You're Having A Bad Day? Just think, it could be worse... Feel better? I hope you're having a better week than I am... I still don't have the big battle report for this past weekend's games ready. I'm still editing and uploading the photos as well as creating the write-up. Real Life TM keeps intervening. A hat tip to my buddy, Rafa, for sending me this graphic. And special greetings to my friend, V.! COOL NEWS: Space Shuttle / Station Viewing! 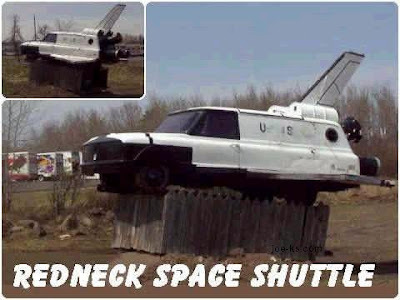 The US Space Shuttle with engines blaring! 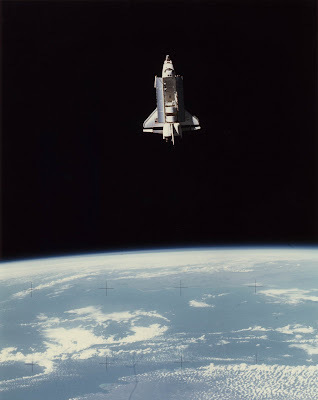 The Space Shuttle orbiting the Earth. 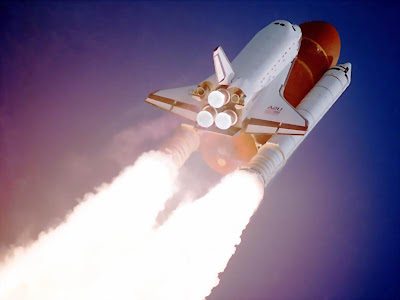 If you are interested in seeing the shuttle and space station pass overhead in the night sky, go to the following link and search for the times you can see it near your city. A special hat tip to my friend, Susan. The closest most of us come to seeing the Space Shuttle. GAMING NEWS: Happy Fantastic Four Fathers Day!
. Happy Fathers Day to all! 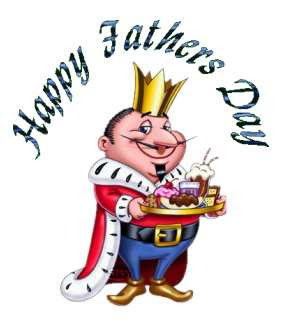 May my Father, all my friends who are fathers and the rest of that whole fathering gang have a great one! 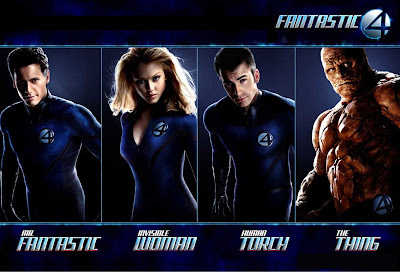 The Fantastic Four, eco-friendly carbon-neutral and enough wooden acting for all! And my second public service announcement is that I saw the new Fantastic Four film yesterday with my baby sister and it stunk. Don't see it. Wait for video. However, it is a good enough excuse to feature some "gratuitous babe" shots since while Jessica Alba's acting skills are on par with a random hunk of rock, she is very easy on the eyes. It's a sad movie when a computer-generated character is the best actor. 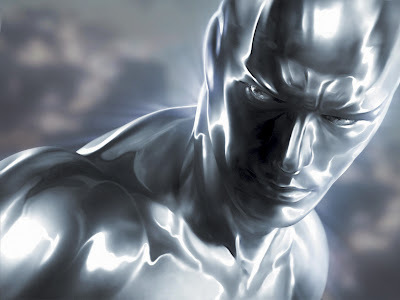 The movie introduced the Silver Surfer character (...voiced by Lawrence Fishbourne run through a few voice machines) to the silver screen, and despite the silver CG character stealing the movie away from the other actors, the film still couldn't be saved. The movie was almost like a giant contest to see who could be most wooden. Despite the intense competition, Jessica Alba probably won hand in fist. Jessica Alba is like... a really serious actress, yah know? And the movie took at least one cheap shot at the US military, intimating that since the Silver Surfer, who had been captured, isn't human that human rights conventions don't apply to him so he could be tortured by all those awful US Army Guantanamo Bay folks... I served at Guantanamo Bay. I know differently. I've never liked how Hollywood not-so-subtly injects its' world views into our entertainment. It was almost as bad as the last Superman movie in which the big guy went from fighting for "truth, justice and the American way" to "truth, justice, and... all that stuff." My advice to those interested in the new Fantastic Four film: wait for DVD so you can skip over the boring parts. 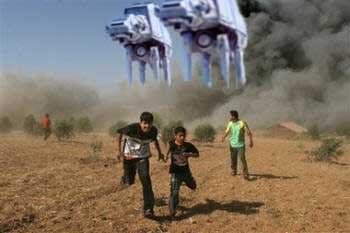 Someday Hollywood will get the message that the plot of a film is at least as important as the special effects. I have now fallen asleep during both Fantastic Four films. Woo hoo! Jessica has acting talent, worthy of... daytime soap opera. In short, yesterday's meeting was alot of fun and I had a great time! A HUGE THANKS to all who came and hosted, played, or otherwise contributed to the general happiness. The 15mm Battle of New Orleans went much as it did historically and the great sea walls made by Mark C. were appreciated and admired by all. Bernie did a great job hosting and Mike O. was very generous to lend his figure collection and terrain to the game. A special thanks to Keith who brought home-baked goodies, "Blondies," to share with everyone! I hear that Jessica loves Pig Wars and the Dark Ages! You go, girl! She's like... historically knowledgeable! The 28mm Pig Wars game was simply a BLAST! I think we must have had about eight players / game participants... However, the BIG WINNER was Keith whose Scandi-who-vian Norveggi Vikings took the day with over 40 points of loot! Mazel Tov, Keith! 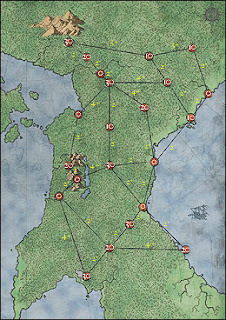 It was a great game and there was much bloodshed and looting that took place throughout a Dark Ages village. Mikos and Vince hosted. The game also saw a rare appearance by local gaming great, Mike Ward of Viking Hobby! I did take photos and will put together a photographic battle report when I get a chance. The new club membership cards were also distributed. And again, HAPPY FATHERS DAY! 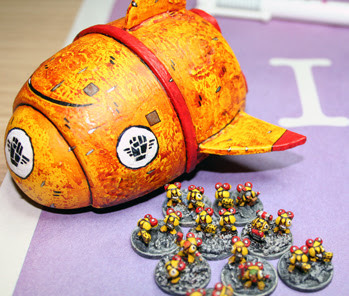 MINI WARGAMING: Ban's Deluxe Dropship!
. One of Bans' deluxe 6mm bird feeder dropships! Bans has the dropship photographed next to tiny 6mm Epic Space Marines figures. 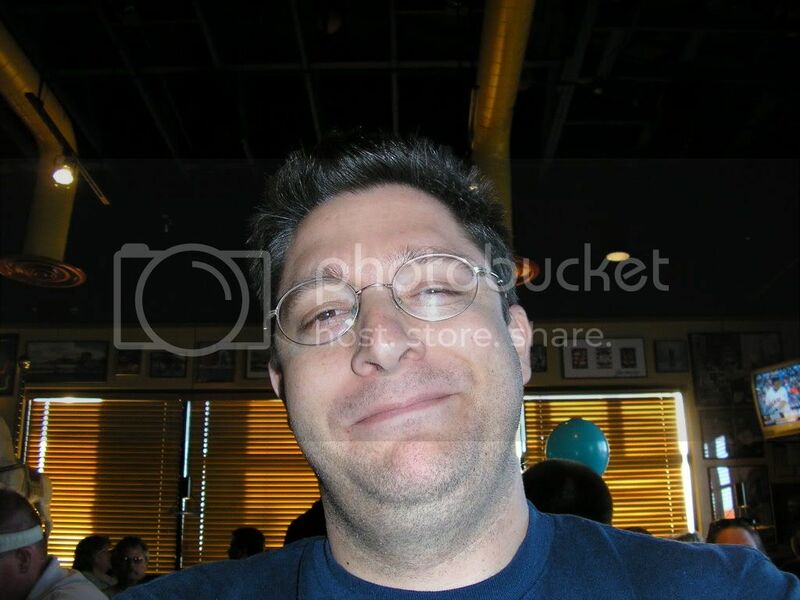 One of my favorite forums on the 'Net is the Epicomms forum... Because I meet all kinds of nice folks there. And among those nice folks has been a unfailingly kind and talented fellow who goes by the nickname Bans. And Bans is TRULY talented. And not only does he share my passion for miniatures, but he's a talented illustrator as well... and has recently contributed a number of sketches to the latest version of Net Epic, the online community's version of the classic Epic Space Marine / Epic 40k game. A front few of the 6mm bird feeder landing ship. Remember the GW old days? I made these dropships thinking about those days, when any bottle could be a city, a tank or whatever you imagined. The project was stopped because I'm now really satisfied with the paint job. Now I think that the two dropships look really fine. They aren't a great models, but they were easy and cheap to make. - Card paper from the packets that you received via postal service (...the United States postal service boxes are the best!) with it you can cut the wings. - Green stuff to finish the model. 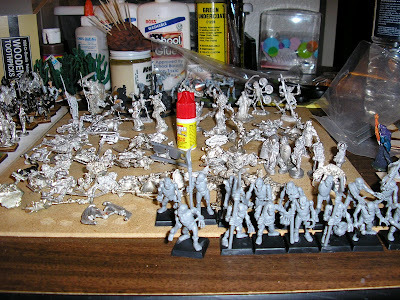 - White wood glue to paint all the model when it's glued. A rear view of the dropship with cool flaming engines! A top view of these bird feeder beauties! If you're looking for an illustrator, he'd probably be interested in some sketch work and I can help put you in contact with him if you'd like. I can't wait for the MWS meeting later today! HUMOUR: Slightly Off-Colour Happy Dwarf Day!
. Are you happy today? - 15mm The Battle of New Orleans at 12:30pm. - 28mm Pig Wars at 3:00pm. Should be good and Fathers Day is on Sunday! We all have our talents, right? I had an auto accident this morning - I hit the back of the car in front of me at a stop light cause I wasn't paying attention. 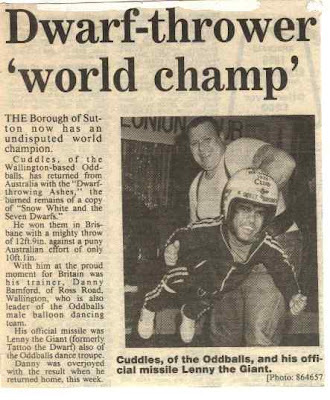 Anyway, the guy I hit got out of his car..... and he was a dwarf! He said "I'm not happy..."
I said: "Well, which one are you then?" 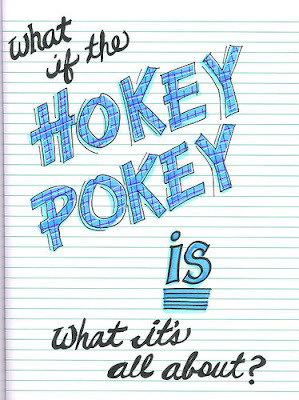 Larry LaPrise, the man that wrote "The Hokey Pokey" peacefully passed away at the age of 83. The most traumatic part for his family was getting him into the coffin. 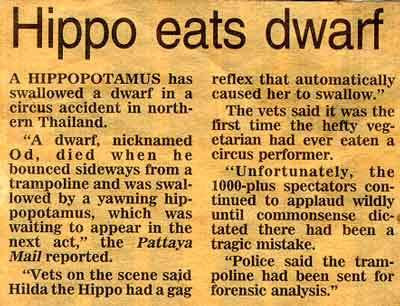 What more can I say... it's a tragedy. GAMING NEWS: Star Wars Moment Of the Day! "Come on now sweetheart, it's FRANCE! You'll love it. You can see the Eiffel Tower and the parks & gardens of Paris... and I'll hang out in a dusty, poorly-lit room playing board and miniatures games with dozens of rolling dice, boxes of Euro Games, and lots of painted miniatures..."
"You mean like you already do at home almost every weekend, Maks?" "No, this is different, sweetheart. It's FRANCE!" "I can visit my buddy, Stephane!" "And buy some of those great Rackham Confrontation figures..."
COOL NEWS: California Capitol Air Show 2007! A beautifully restored P-51 Mustang that made flybys with an F-15 and a F-22. 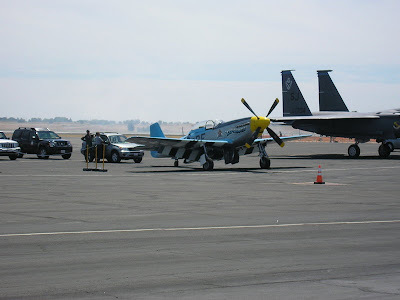 I attended the California Capitol Air Show 2007 this past weekend on Sunday and it was HUGE! There must have been thousands of attendees and it was one heck of a way to wrap up Air Force Week 2007. I bumped into a couple of friends at the show and even someone I served with back when I wore the uniform. 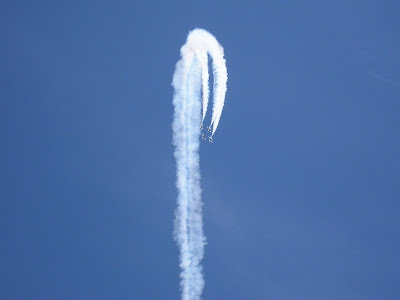 The famous Thunderbirds aerial acrobatics team was there and they were GREAT! At times, the Thunderbirds must have flown about hundred feet off the deck! ...with amazing acrobatics and precision flying. There was tons to see and it was the first air show that several of my sister's children had seen. 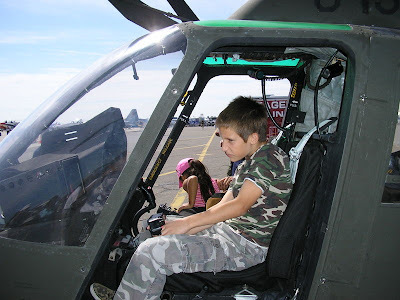 Unfortunately, the "portable video game" generation didn't seem to be as excited by the air show as I remember being as a child. One of the highlights of the show was getting my photo taken by a Russian airplane (a Yak-11 with the moose from Rocky & Bullwinkle painted on its side) by my sister. 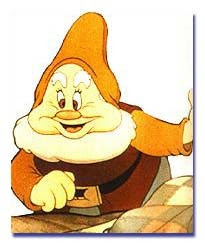 I'll share that photo when I get it from my sister... if I don't look too much like Quasimodo. Speaking of which, both she and I took lots of photos and I've added a link to the best of the photos I took near the bottom of this post. 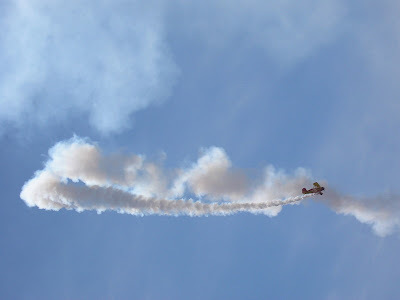 Some of the biplane shows were breathtaking. 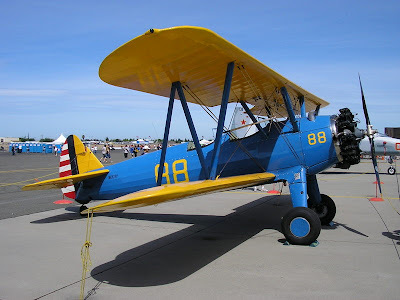 A beautifully restored PT-17 Stearman Kadet, my bro-in-law's favorite plane. Another highlight was seeing the Air Force's latest fighter, the F-22, which was nothing short of amazing to see... its flying capability seem to defy nature and it is so capable as to make other jets seem obsolete. Amazing to see. I brought home a 60th Anniversary Of the USAF (1947-2007) T-shirt and a Thunderbirds ball cap as well as making sure that each of my nephews and my niece left with good presents as well. 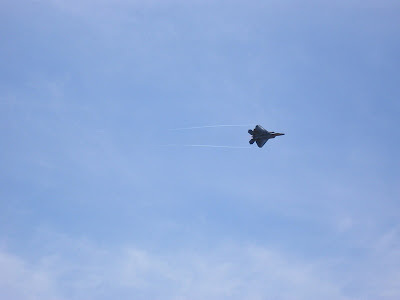 The F-22 in flight was truly beautiful. 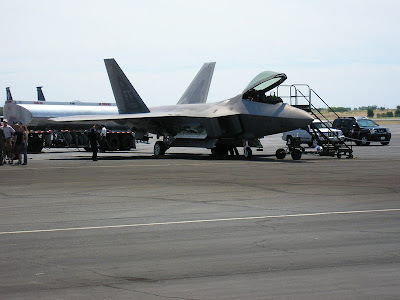 Even on the ground, the F-22 looked beautiful. It's several generations more advanced than every other aircraft in existence! My nephew, Vincent, has a very active imagination! And the kid loves camo! 1. We had a bit of a wait (...about 10 to 15 minutes) to get on the buses at the end of the air show. 2. I got one hellacious "boiled lobster" sunburn... even the tip of my nose! My roommate joked that I finally gave meaning to that classic crayon colour: "burnt sienna"
3. Concessions were overpriced as they always are at these events. However, when compared to many other such events, they weren't so bad. 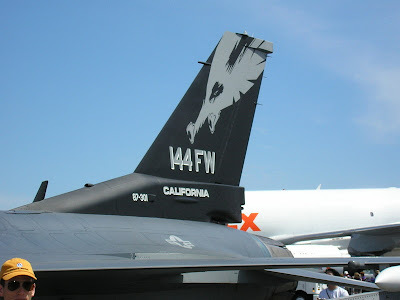 The tail of a California Air National Guard F-16. 1. Far more aircraft and events to watch. 2. Lots of food and souvenir choices. I made sure that my nephews, niece and I all left with a hat and a T-shirt if wanted. 3. Extremely efficient public transport. We took the RT Light Rail and buses the whole way and avoided the hassle of crowded parking lots. 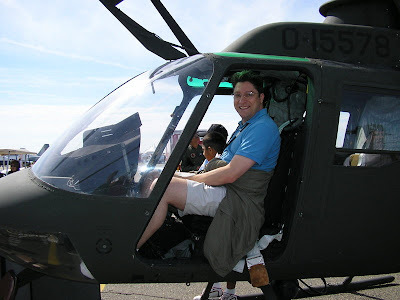 I also posed in an Army scout chopper. 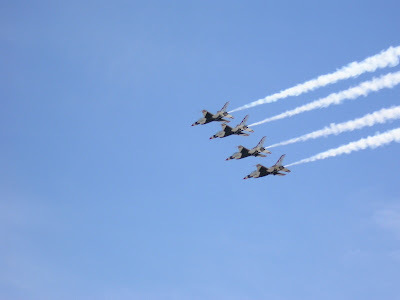 I had a great time at the air show and I'd highly recommend attending next year if you get the chance!